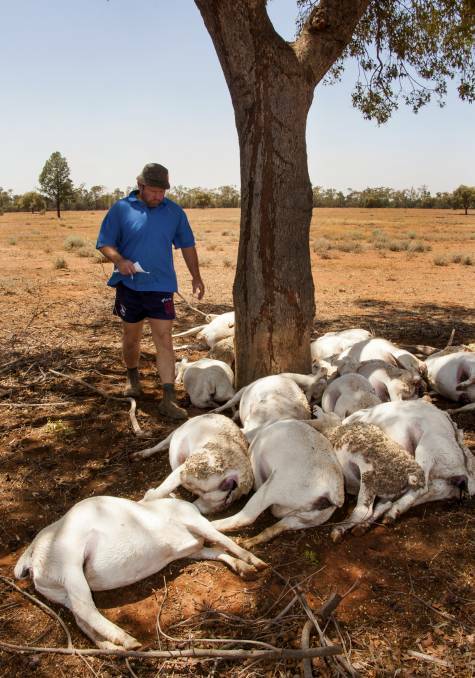 A LIGHTNING strike on Friday killed 17 sheep instantly on a property west of Nyngan. The picture to the right shows “Salty” Taylor surveying the damage on “Rosedale”. His sister Kristal Sztybel took the photo after stumbling upon the bodies while scouring the property for goats with her son Alex, 11. Kristal, Alex and sister Siannah, 9, arrived at the property from their Brisbane home on New Year’s Day, when a huge dust storm descended on the place. “Rosedale” has been hit by four dust storms in the past two weeks. Mr Taylor bought the property less than a year ago and is in the process of building a Dorper herd and unfortunately the sheep killed were breeding ewes in lamb. Click here to read the full story by Daniel Pedersen for The Land.